Beach was an installation based on my memories of the beach during my teenage years in Dubai in the mid 2000s. 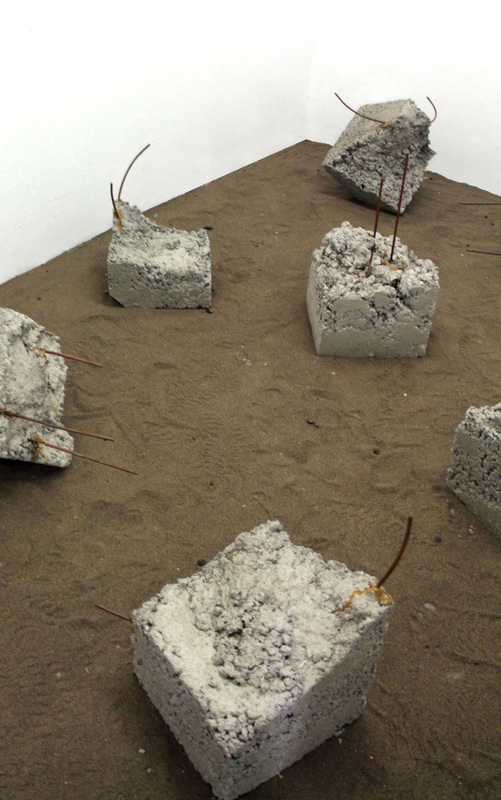 The concrete blocks with embedded metal mimic construction debris from the man-made islands, one of several development projects that took place in the United Arab Emirates during the 20 years my family lived there. Hidden speakers produce the sound of the ocean overlaid with the Azaan, or Muslim call to prayer. I grew up hearing the Azaan five times a day. Like the sound of the waves crashing against the shore, the prayer song gives me a sense of calm. Although this installation carried undertones of loss (the loss of the natural environment as well as the loss of my childhood home), it was also designed to to be a peaceful, meditative space.